Flowers & Gifts of Love has been a leading full service florist in the Dillsboro and surrounding area for many years. Our designer has over 7 years of floral design experience. Whether you prefer something time-honored and traditional or something contemporary and modern, we design our arrangements with you in mind. 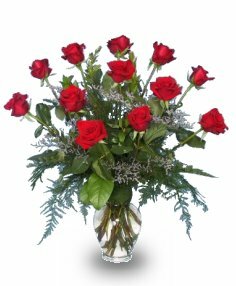 At Flowers & Gifts of Love, we will design breathtaking arrangements for all occasions from sympathy, weddings, anniversary, birthdays, and get well. 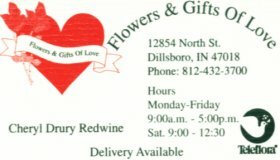 Look to Flowers & Gifts of Love for unique gift ideas for any age or gender such as: delicious gourmet and fruit baskets or a personalized gift basket. We also offer a vast selection of silk arrangements, candles, home made cabinets, plush, afghans, swags, wreaths, pictures, and Victorian and County Cottage accessories. We are conveniently located on North Street and are open to serve your floral and gift giving needs Monday through Friday 9:00 am to 5:00 pm and Saturday 9:00 am to 12:30 pm. We also deliver daily to all local funeral homes and hospitals.